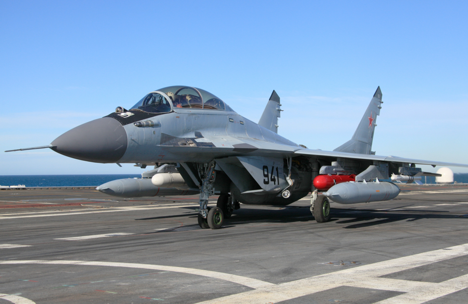 At present, MiG-29K/KUB jets are operating from another Indian aircraft carrier, the INS ‘Vikramaditya’. The MiG Russian Aircraft Corporation is ready to supply the required number of MiG-29K/KUB carrier-based fighter jets for India's planned new aircraft carrier, INS ‘Vishal’, if the Indian Ministry of Defence should want, said Anastasia Kravchenko, speaking for the company to RIA Novosti on Thursday. A day earlier, the Indian media had reported that Delhi had asked four countries for proposals on supplying fighter jets for the ‘Vishal’, which will carry more than 50 aircraft. "MiG and India's Ministry of Defence are long-term partners. We are linked by many years of successful cooperation. We would certainly be ready to supply fighter jets for the new aircraft carrier," said Kravchenko. She said that, according to experts, it would be best both strategically and economically, for the Indian Navy not to diversify its fleet of carrier-based aircraft. At present, MiG-29K/KUB jets are operating from another Indian aircraft carrier, the INS ‘Vikramaditya’ (formerly the ‘Admiral Gorshkov’). Russia is currently completing a contract (signed in 2010) to supply 29 carrier-based fighter aircraft to the Indian Navy. So far, 23 have already been delivered to the navy. The carrier-based MiG-29K and MiG-29KUB jets are generation "4++" multirole aircraft, designed for fleet air operations, achieving air supremacy and hitting surface targets on water and land with precision-guided weapons, by day or night, in any weather conditions. The aircraft have an improved airframe with a high composite material content, quadruple-redundant fly-by-wire flight controls, significantly reduced visibility in the radar spectrum, an increased fuel capacity and combat load, and open avionics architecture. The first flight of the prototype MiG-29KUB took place in January 2007. In 2009, MiG-29K/KUB jets successfully performed a series of test flights from the deck of the ‘Admiral Kuznetsov’, a heavy aircraft-carrying cruiser. The maiden flight of the MiG-29KUB production series aircraft, built under a government defence order, took place in October 2013.